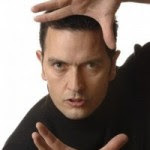 Shimi Illuzini is a professional magician and illusionist from Israel who has been giving lots of performances to groups at camp, including children, teens, families, adults, and seniors. He has been very visible at fundraising events, dinners, and holiday shows. He claims to be 100% kosher. We didn't know magic has to be kosher, but neither did we think water had to be kosher. With over 30 years of experience, with acts in English and in Hebrew, he has performed at the Waldorf-Astoria, Hilton, and other hotels. One of Shimi's specialties is making a child float in mid-air, under hypnosis. Just this week he performed this illusion at a children's camp in Lakewood, New Jersey, where he is now based.